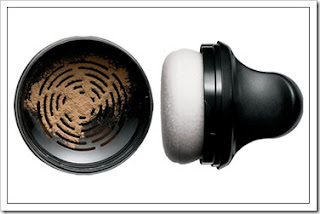 I tried M.A.C's Mineralize Foundation (Loose Powder) at Sydney's airport and absolutely loved it. The powder was fine, light, and felt absolutely velvety on the skin. The sales rep told me that it would provide pretty good coverage, and I was skeptical until I tried it on. I was surprised to see how it really evened out my skin tone without caking up my skin. Unfortunately they ran out of my colour tone, so I made a mental note to get one back in Singapore. Over the weekend, I dropped by the mall and excitedly walked to the M.A.C counter to ask for this. The sales rep STARED at me and curtly said: It is not available yet. It is only coming in sometime in August. To tie myself over the next few weeks, I snapped up one of these instead: L'oreal's Bare Naturale Powdered Mineral Foundation. I'm wearing it today, and you know what? It actually feels pretty good! Sure, it is not pure mineral foundation, but it sure feels like it does the job of one. My skin looks smooth and fresh. A colleague commented that some of my freckles appear to have vanished, vouching for the excellent natural-looking coverage it gives. Application took a while to get used to (powder initially peppered all over the place), but once I got the hang of it the attached brush was a breeze to use. At a fraction of the cost of other mineral foundations, I'm already loving this new buy! the mac one looks so pretty! ooh!! i've seen this before.. in some commercial.. thought it looks really interesting! let me know which one is better and i'll go get it too!! tiff: I can't actually remember how the actual bottle looks! cote-p: Okay, I'll test the M.A.C one come Aug and write something about it!